to the Forum at Washington College. 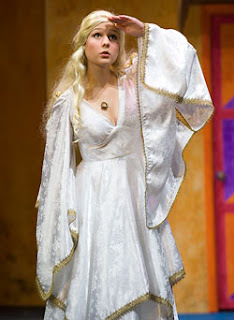 CHESTERTOWN, MD—The Washington College Department of Drama has named Nina Sharp, a rising senior from Centreville, Md., as the recipient of the 2012 Mary Martin Drama Scholarship. Established in 1992 by Matthew Weir ’90 in honor of his grandmother, the great actress Mary Martin, the scholarship is awarded each year to a student majoring in Drama who demonstrates great dedication to any area of the theater arts. The 2012 scholarship award is expected to be approximately $16,000. Sharp, a drama major with a minor in English, has been a self-described “theater geek” since she took on her first roles at Centreville Middle School, roles that included the same character, Peter Pan, that Mary Martin played to great acclaim. Sharp has since played the title role of Anne in The Diary of Anne Frank, Abigail Williams in The Crucible, Philia in A Funny Thing Happened on the Way to the Forum and, most recently, Jill in a production of Equus at Church Hill Theatre. Aside from acting, Nina also has a passion for the technical side of theater, and has excelled in directing, stage-managing, costuming, set constructing, and much more. She has spent countless hours rehearsing, working, learning and playing in Washington College's cutting-edge Gibson Center for the Arts, and will be directing her thesis there in November of 2012. Nina has worked as a part-time stagehand at the Wicomico Youth and Civic Center, and this summer she is interning at Church Hill Theatre as an assistant director for the Green Room Gang Theatre Group. She has worked for five years at Chestertown Natural Foods and served as a dormitory Resident Assistant on campus her junior year. She has earned a spot on the Dean’s List each semester of her college career. Volansky says Sharp shares with the famous Mary Martin the ability to take a part and make it her own. For theater people, the mention of Martin’s name brings to mind a particularly vivid set of images: Ensign Nellie Forbush washing that man right outa her hair, Dolly Winslow—whose heart belongs to Daddy—shedding her furs, and Peter Pan teaching the Darling children to fly and to crow. Working on stage, screen and radio, Martin brought to life a formidable range of other characters, including Maria in The Sound of Music, for which she won the Tony Award in 1960. Martin also garnered Tony Awards for her work as Peter Pan (1955) and as Annie Oakley in the touring company of Annie Get Your Gun (1948). She toured the United States and the world as Dolly Levi in the international touring company of Hello, Dolly!, which included engagements in Okinawa, Korea, Japan, South Vietnam, and London. 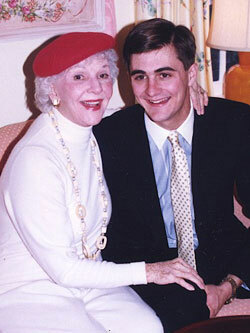 For more information on the Drama Department and the Mary Martin Scholarship, please visit: http://drama.washcoll.edu.